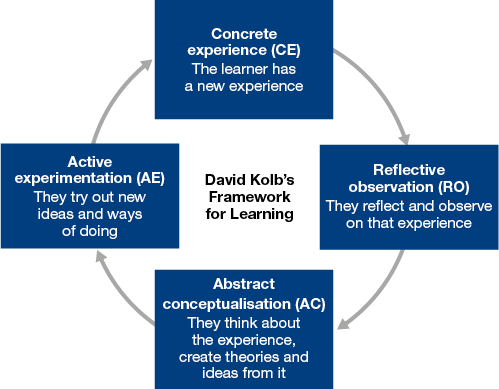 Kolb drawing on the work of Dewey, Piaget and Lewin presents a theory of experiential learning. The grounding premise is that learning is an on-going process, that is best achieved through experience and reflection rather than the simple acquisition and absorption of new information. Effective learning is a process of discovery of new ideas from new experiences. Understanding and seeing opens up new ways of experiencing and being across the whole of our lives. We become effective at learning by managing our own learning processes. A person has to not only know what they are thinking or feeling but also understand how these thoughts and feelings influence their behaviour. Kolb explains that there are four learning processes. The Learning Styles Approach based on the work of Lewin and Kolb recognises that there are different stages in the processes of learning and that each stage is needed for effective learning. According to Honey and Mumford everyone has a preferred style of learning, but how we learn can change through experience and in different contexts. They developed the Learning Styles questionnaire as a tool to diagnose an individual’s learning style and to help them understand how to learn more effectively.